Canons are a brilliant way to introduce a group of singers to harmony. There are no difficult parts to be learned, and yet the singers can very soon enjoy the wonderful harmonies they are making together. 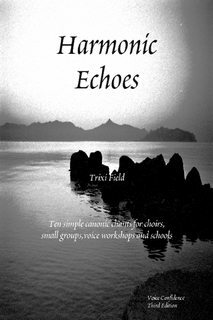 Harmonic Echoes is a series of 10 short, simple canons which have been very successfully trialled in a number of voice workshops. With recurring themes of love, light and peace, these canons are not only a pleasure to sing, their effect on singers and listeners alike can be one of meditative stillness and joyful calm. Accessible and easy to learn, they progress from very simple to more challenging later in the collection. Although intended for a minimum of three voices or groups of voices, Harmonic Echoes can also be used as solo voice/unison chants if so desired.